Following their defeat at the Battle of Barnet the previous month, the 6,000 strong Lancastrian army under the command of the Duke of Somerset were seeking to cross the River Severn into Wales to join forces with Jasper Tudor. Learning of the Lancastrian manoeuvres, King Edward IV set off with 5,000 Yorkists to intercept and confront his enemy. 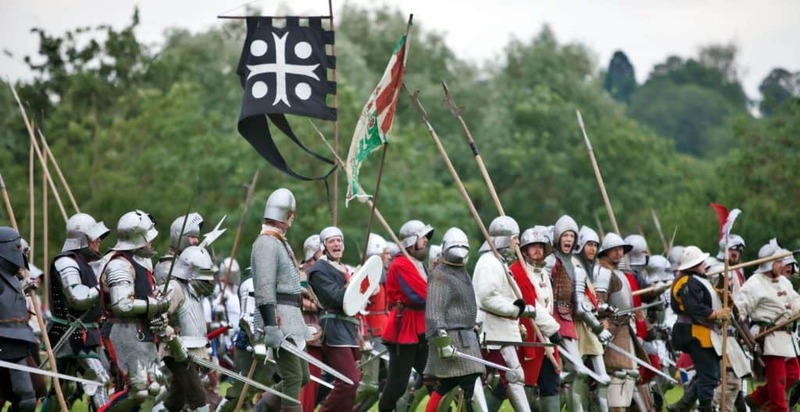 The Lancastrians arrived at Tewkesbury on 3rd May; however rather than risk getting caught attempting the difficult river crossing, Somerset chose to give battle to the pursuing Yorkists. And so, the following morning the Lancastrians took up a defensive position a mile south of the town. Due to the terrain, the Yorkists found it difficult to advance on the Lancastrian position in any sort of order, and so showered the defenders with arrow and shot. Although Somerset led a counter attack, Edward’s men managed to hold them, slowly beating the Lancastrians back along the hedges and banks. The end was in sight when the Lancastrian ranks broke and most were cut down as they fled the field down to the river, an area still known today as the Bloody Meadow. The Lancastrian Queen Margaret who was taking refuge nearby was captured and imprisoned, whilst her husband King Henry VI was executed shortly afterwards (as pictured at the top of this article). The battle marked the end of the second phase of the Wars of the Roses; Yorkist monarchs would rule England peacefully for the next fourteen years.